I certainly experienced an example of goodwill recently collecting money for a hospice. A friend and I stood in for someone too unwell to attend this fund raiser. It was a chilly evening as we and a choir stood outside an underground station during the rush hour. As people entered and left the station many of them looked deep in their own thoughts. 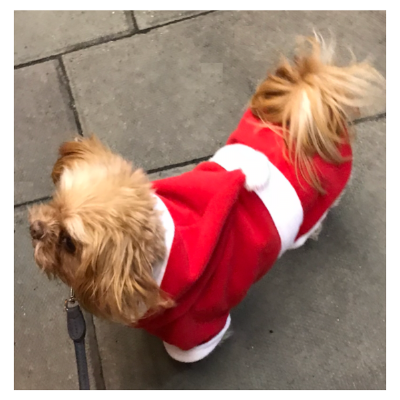 Then, as they heard the choir singing the expression on many of their faces began to change and we saw several commuters smiling as they saw another ‘volunteer’- an enthusiastic little dog dressed in a Santa suit. Regardless of whether people gave a few coins or notes, they all looked delighted to contribute to the worthy cause of the charity. It is a scientific fact that when we give to others, a surge of the ‘feel-good’ hormones serotonin, oxytocin, endorphins, and dopamine may be released in our bodies. This is a time of the year when we often get together and sing. Choir singing is known to promote well-being. Swedish research has suggested that it not only increases oxygen levels in the blood but triggers the release of ‘happy’ hormones such as oxytocin, which is thought to help lower stress levels and blood pressure. Acts of kindness do not need to take a huge effort. A simple gesture can make a big difference to someone’s life. Keep in touch with friends and/or family. Most people are only a telephone or Skype call away. Often till assistants say hello and ask how we are. They usually have their name on a badge. Smile back and use their name to ask how they are. Let someone in the traffic lane. They usually “pay it forward” and let someone else in later. Hold a door open for the person behind you. During this busy time remember to give yourself an act of kindness. Perhaps a luxurious soak in the bath, take time to watch a favourite TV programme, or listen to joyous music. Animals are sentient beings. Just like humans there are times in their lives when they need a little extra support. Our government has stated publicly that animals are not merely commodities; they are sentient beings-in other words-able to perceive or feel things and can therefore suffer. Animals need certain things to be healthy. The right diet, enough water and somewhere safe to call home. They are affected by their surroundings just as we are. To achieve well-being, they need to be treated with compassion and respect by humans. Part of my work includes working with animals. Prior to our December snow, it seemed every time, I looked out into the garden, more leaves had fallen. Take care when sweeping or shovelling up leaves, twigs, or dried grasses that there is not a sleepy hedgehog or frog amongst the leaves. During the cold weather, always check the car before starting the engine and driving off. Cats have been known to curl up on top of tyres to get close to a cooling car engine to keep warm. Banging on the bonnet will give them warning and time to get away. If you are someone with a bird bath, just as in the summer we check to ensure the water has not evaporated; at this time of year we need to check the water has not iced over. Birds need calorie-rich suet, sunflower hearts and peanuts to maintain fat reserves on frosty nights. If you have a pond, the RSPCA tell us to check for ice as toxic gases can build up if it freezes over, and may kill fish or frogs hibernating at the bottom. Most of us enjoy treats over the festive season. Pets enjoy treats too. Did you know chocolate contains two ingredients that can be toxic to our feline and canine friends? - (caffeine and a chemical called theobromine.) If you think your pets may have eaten chocolate, it is always best to check with your vet. Animals are taken in by sanctuaries and rescue centres for different reasons. Some animals may have been abandoned, or rescued from situations of suffering and neglect. Some may be there simply because their owners who have loved them are too ill to look after them or have sadly passed away. There are many pets looking for forever homes. For some animals this is their last chance. There are numerous unsung heroes working away in the background whose main aim is to improve the physical and psychological well-being of our fellow animal creatures. What kind of day will you choose? Which side of the card would you choose to represent your day?